How to commemorate all we’ve been through together? Sure, there were some tears. Maybe we saw other people for awhile but now we’re together again. Thus your Blog Hostess decrees commemoration in GIFS. who could forget doña Cayetana at the Empire Ball in New York. Zog I of Albania and his new Hungarian-born queen, Geraldine. JFK gives Farah the full up-down in front of the Shah before the National Ballet. and the image that requires no words. Royal Jinx at 2016 Euro Championships? Belgium, ranked #2 by FIFA even though we all know those rankings are total BS, seemed to have a cake-walk when they drew Wales instead of England for the Euro Quarterfinal matchup. King Philippe and heir-apparent Princess Elisabeth were shocked with the rest of the Red Devil supporters in the stands. This isn’t the first instance of underdog victory against footballers representing a monarchy. During the round of 16, Prince William expressed his joy that England would be playing Iceland instead of facing off against the animated hair-gel sculpture also known as Cristiano Ronaldo. Yup, we’re in the future also…Unfortunately, the Duke of Cambridge didn’t realize that his prescense at the 3 Lions’ draw against Slovakia had already sealed their fate against the little Ísland that could. Most of you know that here we don’t gush over the Windsors at all but those specs on William are terribly becoming. However, your Blog Hostess and most of ITV’s viewership were left wondering what ex-BBC pundit Greg Dyke shouted when Harry Kane’s header didn’t hit home. William has yet to comment on the UEFA unpleasantness. felipe VI of spain congratulates the Spanish National team after their 1-0 victory against the Czech Republic. “At least I’m not as short as Iniesta,” the monarch reassured. 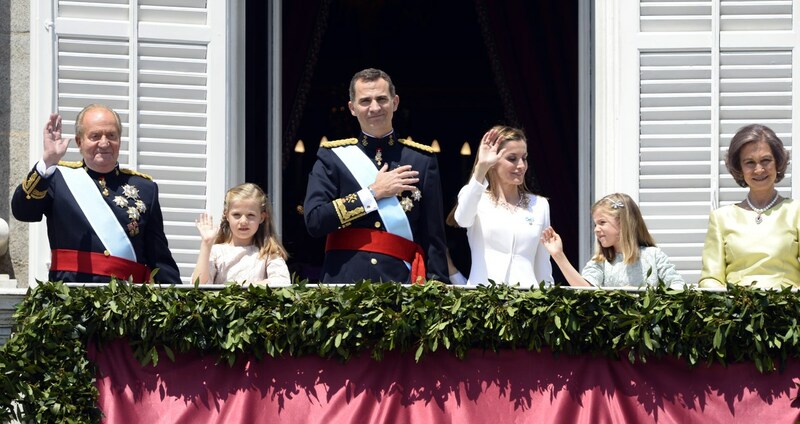 King Felipe was definitely spotted in the bleachers more than once to root for defending champs Spain this June. We are also 98% certain one of his daughters was in attendance at least once. (Don’t ask us which one, Sofía and Leonor are interchangably indistinguishable unless they stand side-by-side.) Although the ‘seleccion de oro’ has oxidized considerably since 2012, let’s not blame coach Vincente del Bosque, duke of el Bosque, for the early Euro exit. We all know it’s because Spain’s monarch was in the stands. Strange, Felipe still has his job but they told Vinny to hit the bricks. Finally, we come to poor Sweden. No, they weren’t underdogs. Yes, their showing in the tournament was total malarkey and, in a paltry effort to motivate a lackluster squad to victory, Swedish scoring machine Zlatan Ibramovich announced that this would be the last tournament in which he suited up in canary yellow. Sweden did not advance past the group stage when they failed to beat Belgium. Ironically, Sweden wasn’t jinxed by their monarch or even heir to the throne. Second-born and second-tier royal rep Prince Carl Phillip watched on in Nice. Fun fact, not one but two princes were in attendance. [Cue ‘the Spin Doctors’ if you can stomah it.] Prince Albert of Monaco made the 20-minute drive to watch simply because he enjoys the beautiful game. No image appeared of the man who puts the ‘prince’ in ‘principality’ on international broadcast because Albert was there for the love of the sport, not a political photo-op. Seriously royal personages, who wears a scarf and a suit in late June? Think it through! Yeesh! As a girl who enjoys billing herself as “more superstitious than a Pisces starting pitcher,” we feel we must implore the Duke of Cornwall to stay home. Charles also enjoys a moniker as prince of a wonderful country that’s having one helluva Euro debut. But please, pretty please, learn a lesson here and don’t attend the semifinal. Make your sons surrender their passports! Watch the match on the telly in the living room if you suddenly espouse Wales. We are simply having too much fun watching the Unselfish Eleven to say goodbye just yet. We supposed you could also call Iceland “the Unselfish Eleven.” The two squads probably wouldn’t mind sharing the honorific. 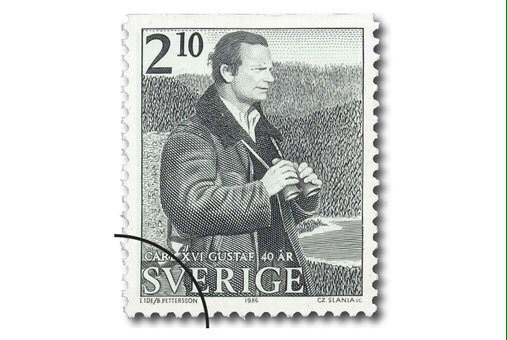 How better to kick off the King of Sweden’s 7oth Birthday hullabaloo tomorrow than with a 30-year retrospective in stamps! It’s not our first episode of Fun with Stamps but gee is it fun. 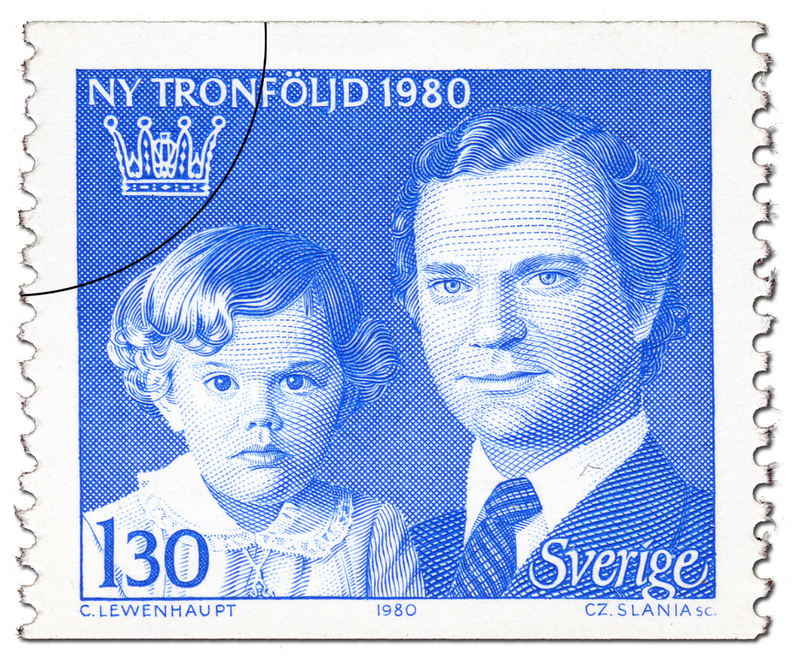 Especially because dear ol’ Carl Gustaf tends to eschew the humdrum lone-world-leader-in-profile look in exchange for an en-medias-res motif. Like this 1986 stamp below where the mountainous landscape almost distracts from the monarch who just turned 40. To be fair, your Blog Hostess is not sure which of the 40th birthday stamps we prefer: Birdwatching Carl G. or paterfamilias. Yeah, it’s just me and the fam, kicking it in gazebo 47. By the way, do you think it’s Victoria or little sister Madeleine who appears to be contemplating quantum physics? Besides a visual reminder of just how much the price of a stamp inflates in ten years, we also get to watch the kids grow up! Although I don’t think they did the Crown Princess too many favors in this next rendering for the King’s 50th Birthday. It’s not just the royal family, with whom the King is willing to share his stamp monumentalization. Yes, we know it’s not a word! This offering for the monarch’s 50th birthday also features the Albert II, King of Belgium. Nice day for a ride, hey Albie? Ten years ago, the Swedish Post Office attempted to go run-of-the-mill with Monarch in Profile style but instead we get a very Alfred Hitchcock Presents for the Swedish King’s 60th. *In 1980, it was decided in Sweden that the eldest child of the King would inherit the throne regardless of available male heir. Now Carl Phillip you can go half-empty or half-full with this one. Did you lose the throne or dodge a bullet? Sounds like a headache you don’t really need. He’s a new dad, looks easy-going, I’m sure C.P. is fine with it all. Naturally, last Sunday, your Blog Hostess and the Right Honorable Mr. Blog Hostess headed down to one of the viewing sessions prior to the Magnificent and Noble Jewels auctions. All photo & video credits unless otherwise noted are the exclusive property of Emilio Zarco, trademark, copyright, rights of use in perpetuity. Yes, they allowed your Blog Hostess to handle it but no–just like when we examined the Art Deco Kokoshnik of Híjar–they do not let you try it on. No, we didn’t ask but we wanted to appear like a serious jewelry shopper not a six year-old at Disney. The tiara was made as a wedding/coronation gift for Geraldine Apponyi de Nagy, a Budapest-born daughter of a Count, whose beauty earned her the moniker “the White Rose of Hungary. See Queen Geraldine glitter past in the diamond tiara below. Queen Geraldine…we all know your Blog Hostess isn’t getting sick of that rhyme any time soon. The gold frame is set with European and circular cut diamonds totaling just over 28 carats while the baguettes used to create the flower stems weigh in at 4.8 carats. No, you’re not ‘shrooming, the tiara does feature a goat’s head and, yes, the temptation to call it the “Goat’s Head Tiara” is staggering. It’s actually a ram’s head that sits atop a bandeau of Albanian wildflowers. The Ram of Skanderberg was the chosen symbol of the Albanian Royal family by Zog; the newest monarch in Europe actually added Skanderborg to his name thus attaching himself to the eponymous national hero, a nobleman and warrior from the 15th Century. …at the bridal coronation of Queen Geraldine of Albania, Geraldine was a Roman Catholic countess betrothed to a Mohammedan king. A royal crown usually bears a symbol of the monarch’s faith…religious motifs in the ornamentation…my problem was to establish a royal but not a religious motif. I found it in the crest of the Kings of Albania. This bears the stylized head of a rare mountain ram, which roams the snowy peaks of the beautiful Albanian mountains. A sculptured head of the ram I had encrusted with diamonds and set in the centre of the tiara; this tapered down to a border of white roses made of diamonds, the leaves fashioned of diamond baguettes—a decorative and distinctive crown for [a] decorative & distinguished queen. Last week was the second time Geraldine’s Diamond Tiara made it to the auction block. Back in the 60s, pharmaceutical mogul Elmer Holmes Bobst procured this tiara so his wife Mamdouha could wear it to a 1966 dinner at the White House. . Friends said that Mamdouha–great name, sure there’s a story there–always wore her finest jewels when invited to events, considering it the ultimate compliment or way to honor her hosts. Your Blog Hostess is unsure how she feels on this policy.Jealous? Yeah, that’s probable. A lavish vintage of the bubbles would suffice in the Blog Household. Mamdouha in the White House avec Queen Geraldine’s tiara. behind the tiara: Zog plus Geraldine sitting’ in a tree plus a monarchy crumbles. In 1932, King Zog of Albania saw the débutante photo of a Hungarian-born countess, Geraldine Apponyi, the 17 year-old was dressed as Mimi from La Boheme. It was love at first daguerrotype. After her 21st birthday, Geraldine, impoverished and working at a library in Budapest, received a letter from Princess Senji, King Zog’s favorite sister, inviting her to court. Princess Senji (see left) was scouting Europe for the best blue-blooded beauty to be her brother’s queen. The young countess had everything on Zog’s wish list: beautiful duh, didn’t see that one coming; of noble birth check; and most importantly she was not recommended or sponsored by Mussolini who had greedy designs on Albania. The invade-y kind. Ominously, the House of Zoga’s reign was doomed since the wedding ceremony. Il Ducce sent his son-in-law Count Galazzo Ciano as witness to the ceremony. The Count left the wedding night for Italy to relay a message cynically, invade. Some guest? What was his wedding gift? Dirty sock filled with soap bars? Anyone who remembers their 10th grade history chapter on Eastern Europe knows Mussolini liked what he heard. On April 16, 1939 King Zog was officially deposed and the Constituent Assembly proclaimed Vittorio Emanuele III the new King of Albania. There had even been the beginnings of a road network before February of 1939. Zog learned that Italy was planning to divide Albania with Yugoslavia. It all fell apart in a series of days. On April 5, Queen Geraldine gave birth to their only child, Prince Leka. On the sixth, panic settled in Tirana as the Italian community began to empty the city. An Italian general arrived at the royal palace with the official ultimatum. If Zog wanted to retain any semblance of his royal status he would have to make concessions basically turning Albania into an Italian province. The same general came by later that afternoon with the ambassador to wish their congratulations upon the royal birth, then asked Zog’s decision. The family prepared to flee across the Greek frontier towards Turkey then Romania. Queen Geraldine, weak and bleeding from childbirth was carried down to the car and bundled away in the night with her sisters-in-law and her infant son. Over the course of the war the Albanian Royal Family bounced around Europe, eventually finding Great Britain to be the safest haven, even during the carpet bombings. Although not officially recognized in the UK or the US as a head-of-government-in-exile, Zog of Albania was known in London for this poker parties. Here’s where things get really weird. During their years in exile, the CIA uncovered that King Zog had been sleeping with Princess Senji, his 3rd and favorite sister of the six he had. More bizarre is the fact that the Queen knew about the brother-on-sister action and was ostensibly unfazed. It isn’t so far-fetched to conclude that this portrait, supposedly taken in Italy, was taken during their affair? It seems so odd that anyone besides the Queen would wear a coronation tiara…upon closer inspection it looks like a different tiara. The ram’s horns face the right, not the left. Zog died in 1961, Leka became claimant to the throne. In 1973 he married Susan Cullen-Ward, daughter of a wealthy Australian entrepreneur. It was said the the Dowager Queen was “radiant in a elegant little tiara and a powder-blue dress.” We know it wasn’t her Diamond Coronation tiara, it had already been sold. Stockholm, April 19, 2016: At 6:25 pm local time, Princess Sophia gave birth to a baby boy in Danderyd Hospital. Prince Carl Philip, the 2nd of King Karl Gustav and Queen Sofia’s children, was present for the entire delivery. You go Carl! We don’t think we could stomach it! A few hours later the Prince announced the royal details for the press. No, he is not describing the fish that got away. The new baby prince tipped the scales at 7.9 pounds and was approximately 19.3 inches long. (We guess these numbers mean more to those who have given birth themselves.) Carl and Sofia’s new prince is 5th in line to the throne of Sweden following his aunt, Crown Princess Victoria, his cousins Princess Estelle and Prince Oscar and, lastly, his own father. The Duke and Duchess of Värmland have already returned to their new home at the royal residency Djurgarden Palace with their son, to whom we will refer as Prince Värmland until further notice. The couple had recently vacated their luxury apartment on the Stockholm island and moved 14 miles west into the private grounds of the royal palace. Carl Philip and Sofia live in Sjöpaviljongen, a quaint 18th Century cottage whose name translates to “lake pavilion,” about a quarter-mile from the palace itself. The new family will stay at the lake house until renovations on Villa Solbacken–also on Djurgarden Island–are finished. Either way, we are still waiting on for the name and that famous cannon salute. It did not take this long when Prince Oscar was born about a month ago. 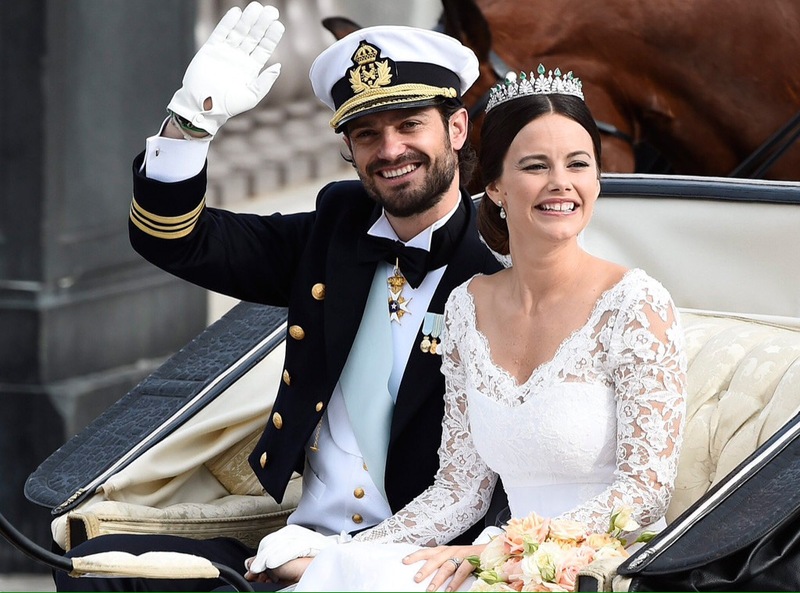 Prince Carl Philip married Sofia Hellqvist less than a year ago on June 13, 2016. Sofia had an “interesting” past which included such occupations as “glamour” model and reality show contestant. In 2007, she moved to New York to study accounting with computer application and other generic-sounding corporate stuff. Hellquist also started a yoga studio in Manhattan. The new Princess has been very active all throughout her pregnancy and has looked smashing too.